-1- Official international competitions must be organized by national federations affiliated to C.I.P.S.. The organizing federation will be officially responsible for the competition in question. -2- Only those who are members of a national federation affiliated to C.I.P.S. with their full annual fee paid for shall be admitted; they are to be nominated by the federations they are members of; the anglers who make up the teams of the clubs or national federations must hold the nationality of the latter. the competitor must have been dwelling in this Country in the past 5 years. Competitors shall always be able to prove their nationality by means of ID cards or passports or other documents attesting that. All supporting documents shall be presented at the 1st team managers’ meeting. An angler, who has already participated in a World Championship or in an international competition representing a nation, cannot compete for another nation. Only teams that are members of the national federations shall be admitted to World Championships and Zone Championships (Europe, etc). In order to apply for the organization of a championship, the nation in question must have participated at least once, during the past three years, in the championship that it proposes to organize. A preview programme must absolutely be sent to the secretary of F.I.P.S.e.d. before the end of November in the preceding year. With the exception of the World Fishing Games, F.I.P.S.e.d. is officially responsible for providing the software program and all certificates and classifications for prize-giving for all the championships; in this case, the organising Nation shall meet all board and lodging expenses (room, meals and closing gala dinner) for the person undertaking this work; the stay may begin on the eve of the first day of practice and end on the day after the closing dinner; F.I.P.S.e.d. will be responsible for travel costs. For all F.I.P.S.e.d. championships, the organizing Nation shall meet all board and lodging expenses (room, meals and closing gala dinner) for two members of the F.I.P.S.e.d. Directive Committee, in addition to a person charged for classifications; the stay may begin on the eve of the first day of practice and end on the day after the closing dinner. A championship cannot be awarded to a nation if the nation does not undertake to put live fish back into the water after they have been counted and weighed (it is forbidden to kill fish). The nation which organises a World or Zone championship will be responsible for acquiring the trophies which will be paid for by F.I.P.S.e.d. ; the nation must provide 3 trophies for the team trials and 3 trophies for the individual trials. F.I.P.S.e.d. will reimburse a maximum amount of 300 € for 6 trophies. These trophies must have a plaque, on which will be inscribed “F.I.P.S.e.d.” as well as the place and date of the championship. An invoice will be required in order to justify trophies expenses. 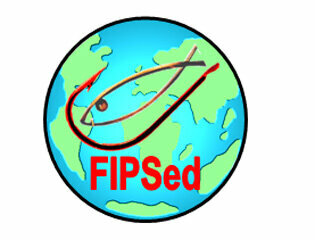 If these dispositions (plaque or logo) will not be respected, there will be no compensation from F.I.P.S.e.d.. F.I.P.S.e.d. will continue to provide the medallions. Programmes and invitations for all championships should only be given to nations which are members of F.I.P.S.e.d. (no invitations should be given to clubs or individuals). -3- Each nation that is a C.I.P.S. member will be allowed to present only one team composed of 5 anglers and 1 reserve who must be nominated before the first draw. No competitor will be allowed to participate as an individual. In the event of injury during a competition, the first-choice participant may be replaced by the reserve member regularly entered in official documents, although fishing tackle cannot be replaced. The substitution shall be authorised by a JURY member. -4- The competitions must be organised at watercourses, such as rivers or channels or in suitable water basins, such as lakes etc. ; it must be possible to fish along the entire width of the venue; the depth must be as even as possible in the entire area and it must be at least 1.5 meters; the minimum width allowed for a venue is 50 meters. A possible fishing restocking program must be submitted to the F.I.P.S.e.d. Technical Commission; in any case the fishing restocking must take place at least 2 months before the championship. A film or a photographic document reporting the restocking must be supplied by the organizers to the F.I.P.S.e.d. Technical Commission. -5- The venue must be as straight as possible, and present equal fishing conditions for all competitors; furthermore, the venue must allow anglers to stand in a continuous line, avoiding interruptions such as power lines, bridges etc. as much as possible. The venue must not present any dangers for the competitors or the spectators. One or more members of the technical commission shall perform an inspection of the venue, which may be selected for a championship, and this inspection must take place at the time of year corresponding to that proposed for the organization of the competition in question; the report of the inspection shall be submitted to the Executive Committee of F.I.P.S.e.d. for evaluation and decision. The final approval or rejection of a venue by F.I.P.S.e.d. will be transmitted to the candidate nation. The F.I.P.S.e.d. shall be responsible of the travel expenses (airplane, train or vehicles), while the organization shall be responsible for the transports on site from the airport or train station as well as for boarding and lodging expenses. To choose the official accommodation proposed by the organising Nation (optional). the price of the closing gala dinner. To find one’s own accommodation. 1.200 € (including 9 closing gala dinners and 6 fishing permits). If no details about the accommodation have been specified by the deadline set up by the organization, the participating nations will have to deal with their own accommodation and then they have to pay the respective entry fee to the organization. Any Nation that fills in an entry form and undertakes to participate in a championship but then does not take part must in all cases pay to the organising Nation the contribution provided for the respective championship. Nations failing to observe this rule shall be forbidden from taking part in and organising future championships. All participating nations have the obligation to inform the organizing nation about their arrival date at least two weeks before the first training day. Any absent nation (yet to arrive) on Thursday training shall be considered as WITHDRAWN and may not participate in the championship (refer to the list of sanctions; article 31 § c). Organizers must pretend entry cards correctly filled with mobile phone number of a delegate and of the team manager. Addresses and emergency telephone numbers (police, fire-fighter, hospital, etc.) must be present on the programs. The Championship will take place in the 2nd week-end of July. -6- During the competitions, competitors must have an angling position (ring) within a minimum range of 15 meters; 25 meters is the optimum size. The maximum size allowed is of 50 meters. The width of these rings shall be established together with the technical commission. The angling position of each competitor will be separated by a banner zone of 1 meter maximum on the left and right sides (the space may be reduced or even left out). The angling position must be well defined so it is isolated from the spectators; for this purpose, it is possible to erect a fence or set up ropes at an adequate distance from the shore (we recommend a distance of at least 10 meters); furthermore a corridor must be created so that officials may use it. This corridor shall be created between the anglers and the spectators. This official corridor shall under no circumstances be occupied by fishing tackle. The team managers, 2 per Nation, may enter their teams’ competitors’ angling areas (ring); they shall wear a GREEN back number marked by a C lettering referring to his function. Only one team manager at a time shall be allowed inside an angling area (ring). The reserve shall dress a RED back number marked by a R lettering. The organisation must customize each angler’s ring by means of a board indicating the name and the nationality of the competitor and also the number of fish caught, with hourly updating. Nations will draw lots in alphabetical order to determine the call-up order of the draw for the first leg; the call-up order will be inverted for the 2nd leg (e.g. : the nation which drew by lot as first the first day, will then draw as last one in the second day, etc.). Various pieces of information about the progress of the championship. Draw allocating the competitors a competition slot in the various sectors. -8- The drawing lots for each leg must be carried out at least 90 minutes before the beginning of the competition, under the scrutiny of the organisers and in the presence of the team managers or delegates of each team and of the representatives of the F.I.P.S.e.d..
For the two legs, the distribution of the 5 anglers in their sectors shall be determined by drawing lots in the day preceding each leg. The assignment of the positions for the 1st leg will be made according to an automatic drawing system previously arranged by F.I.P.S.e.d.. This grid has been constructed in such a way that the anglers of one team are spread out within a fifth of a sector. The assignment of the positions for the 2nd leg will be made by drawing lots carried out by each team captain (or by his delegate), just considering tail-enders and pre-tail enders. -9- In streams, rivers and watercourses, angling position number 1 must always be situated downstream; in water basins (lakes, ponds, etc.) position number 1 will always be situated to the left looking at the lake and the marking will run from the left to the right. The back numbers of the anglers must be of a different colour for each sector (except green or red) or shall be of a neutral colour with different coloured lettering for each zone (sector). -11- a- Each competitor will have 90 minutes to prepare himself. As soon as the anglers arrive to the venue, they must wear their back numbers and deposit all their equipment at the allotted ring, without entering the ring (these rules also regard those who help the anglers transport their equipment). It is not allowed to prepare the material until the official starting signal is given, indicating that the competitors are allowed to enter their rings. During the subsequent preparative operations, the competitors may not receive any help. All materials may be handed over to the anglers until the baiting signal is emitted, but only through each individual steward. After this signal, it is forbidden to supply any kind of material (baits, ground baits and equipment) to the competitors, except for pieces of broken rods, which may be substituted through the individual steward. He may intervene also to help an angler to unfasten the elements of the rod, which are stuck. Baits and ground baits may be handed over to the anglers during the preparation period, but their quantity must be checked by the stewards before the control of baits and ground baits. After the control, anglers are not allowed to receive further quantities of baits and ground baits. Until the signal to enter the ring is given, the baits and the ground baits may be prepared by the angler or a third party outside the ring. After the signal to enter the ring and until the check is performed, this preparation may be performed either by a third person outside the ring or by the competitor inside the ring. b- If the control of baits and ground baits has not been carried out, the competitors are not authorized to angle. c- In case a competitor uses a shorter fish net (less than 3.50 meters), he will receive a yellow card warning, even though the net is used during the two days. If the same athlete will be found with a shorter net during another championship, he will be disqualified. d- The control of fish net and rod length will be carried out after the control of baits and ground baits; one angler per sector, drown by lot, will be controlled. The competitors may reach the venue by their personal means of transport. -12- There must be one steward assigned to each competitor and a general steward for each sector. The individual and general stewards must have full knowledge of the rules of the competition. c- that the competitors present at the control the quantities of baits and ground baits that are indicated in the program. In the event of non-compliance, the competitor will be reprimanded - (article 31 a). The list of competitors who have been reprimanded will be announced at the Captains’ Meeting. If the offence is committed again during the second leg or during the following championship, the competitor shall be disqualified as a recurrent offender (article 31 b). Apart from hooking bloodworm, bound only for the hook and kept and presented in the water (baiting bloodworms shall be kept in the proper boxes of “official measure”), any other bait bound for ground baiting or hooking shall be presented in “official measure” boxes; the boxes shall be closed without the use of any instrument required to keep them in the same conditions (e.g. adhesive tape may not be used to keep the lid closed). Any other form of presentation of baits during the control will be seized and sanctioned (one point penalty in the sector ranking). The ground baits must be presented at the control in graduated buckets and the baits in boxes of the “official dimensions”. The competitors must obligatorily be equipped with their own buckets and boxes of the right size. Competitors not in possession of “official size” boxes shall receive one penalty place on the sector score table (for example, a competitor who does not have boxes at the end of the leg and is awarded 5th place will be assigned 6 points instead of 5. The competitor in sixth place shall, in any case, be assigned 6 points). The sieving of ground baits (through a sieve, hamper, landing nets’ tip and others) as well as the mixing (with electric mixer) is forbidden once the check has been carried out. In the time lapsing from the control of baits and ground baits and the heavy ground baiting, the use of sprayer is allowed only to stick and preserve the baits. d- collect a possible surplus of baits and ground baits after the control. d- at the end of the competition, he shall keep the angler’s fish caught under observation and forbid the access to any unauthorised person into the angling position until the arrival of the weighing team. Together with his angler, he will sign the weighing protocol indicating the weight of the fish. -13- The competitors must observe all legal fish size limits, if they are in force for the competition (national rules). These sizes shall be made public during the 1st team managers’ meeting (and it is the team manager’s responsibility to ensure the competitors are informed). Fish must be kept alive in a micromesh keep-net. The keep-net mesh cannot exceed the measure of 10 mm on 10 mm. The keep-net shall have either a minimum diameter of 40 cm for the round ones or a minimum diagonal of 50 cm for the rectangular ones and a minimum length of 3.50 meters; it shall be submerged underwater for at least 1.50 meters during the entire competition. It is not allowed to use other systems for keeping the fish. The competitors must have their own keep-nets with them, unless they are supplied by the organizing federation. Any angler weighing maimed fish at the weighing procedure will be sanctioned. -14- The composition of ground baits and baits must be of natural origin. It is forbidden to use products of metal origin. Artificial baits of whatever material (polystyrene, rubber, sponge, etc.) such as maggots, silkworms, moths, bloodworms, earthworms, etc. are forbidden. It is forbidden to fish with spoons, artificial flies, baits using living or dead fish (or fishes’ parts), other animal species such as frogs or fish roe. All surpluses of ground baits and baits must not be thrown into the water after the training period and the competition. -15- The competition shall take place by sectors or under sectors in two legs of 5 hours each (schedule recommended: 9.00 a.m. to 2.00 p.m.). In case of competitions with less than 20 participating Nations, sectors will not have any separations, or will have a number of separation as little as possible. As regards to separated sectors, these ones should obligatory be separated by 3 pegs at least. In case weather conditions do not allow the good course of the event, Jury can decide to cancel the leg. The cancelled one will not be considered. The ranking list will be drawn up according to the disputed leg. The cancelled leg will not be rescued. In case of forced interruption (e.g. thunderstorm), the jury can valid the leg if it has lasted two hours at least. -16- Each competitor is expected to follow rules of the competition integrally. -17- Only simple hooks may be used and the maximal span between the tip and the shank must be 7 mm (n. 10). In case a member of the jury notices or is invited to notice the evident infringement of the articles 17 and 35, during a leg, he has the possibility of requiring the control of the angler’s line or to verify the length of the rod of the angler in question without waiting for the end of the fishing action. If the angler in question refuses to accept the control, he will have to appear before the Jury. Baits used on the hook must not be mixed on the point, but must be put onto the hook (bread, paste, mixture of substances or baits such as the pellet, boiles, balls of ground bait or pasted baits, etc. are forbidden). The catching of a fish is valid even if it is accidentally hooked outside the mouth. The deliberate foul hooking of fish is prohibited. During the competition, anglers are not allowed to use auriculars or walkie-talkies. The possession or use of echo sounders is prohibited, including during training. Only fish attached to the angler’s line when caught, will be considered a valid catch. Fish caught by any other method or attached to the line of another angler must be released back into the water. In case of breakage, the assemblage in use shall make the fish easily get free from the feeder. The maximum feeder size shall be 5 cm of diameter and 7 cm of length; feeders must freely slide on the line or on the belaying-pin rack fixed on the line. It is forbidden to put a stop or a slower (e.g. silicon) between the feeder and the reel. Assemblages must be supplied with a shock-leader as to avoid the breakage when casting. The “feeder method” fishing techniques is forbidden. 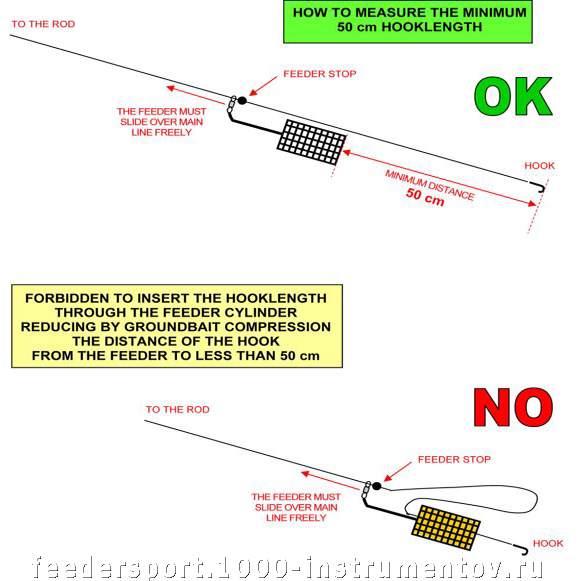 Concerning the end of line, the distance between the hook and the feeder in the line extension must be of minimum 50 cm. -18- Competitors may keep and assemble as many rods as they wish, but they are only allowed to fish with one rod at any time. It will be allowed to prepare feeders in reserve; however, in case of catch of a fish, the fishing action shall be forbidden until the fish caught is put in the landing net. -19- Competitors may not receive any assistance in landing a fish. -20- Competitors are not allowed to receive outside help; only team managers are authorized to access the angling ring of the competitors of their team and this only to give verbal advice; a team manager is not allowed into the ring of an angler who is not part of his team. -21- The usage of platforms with a maximum dimension of 1 x 1 metre is allowed so that the competitors may stand on them; they must be installed in a straight line, clear of the water or, if necessary, partially inside the water (this decision will be taken by the organisation with the approval of the technical commission). Additional platforms may be set up in line with the main platform, but only for depositing materials. In case it is necessary to trace a line to line up all competitors along the venue (string, line traced on the ground, etc.) in order to avoid that some of the competitors are closer to the water than others, this must be carried out before the training period starts. -22- Competitors may use the space allotted to them in any way they want; but they are not allowed into the possible neutral zone. Inside the space allotted to them, the anglers must move discretely and noiselessly. It is forbidden to angle and throw bait or ground bait in the neutral spaces, both upstream and downstream, or in the rings upstream or downstream (if the neutral areas have been eliminated); the fish caught by a competitor and sighted in neutral areas or before the ring of one of the nearby competitors will not be considered valid and must be put back into the water without delay; in case the competitor refuses this and puts the fish in question into the net, without a previous authorization, during the final weighing phase, the person in charge of the weighing must weigh the biggest fish separately and make note of its weight on the competitor’s card. After the deliberation, the Jury shall decide whether to annul the weight of the fish or not in relation to the total weight. The competitor will receive a yellow card warning (see list of warning), if the fish is not considered valid. Photographers and cameramen have the right to access the neutral zone (if there is one), with the prior permission of the adjacent competitors and stewards. Nevertheless, they are not allowed to go beyond a line set up 2 meters behind the line of the competitors. This line must be provided for by the organizers. In the event that no neutral areas provided, photographers and cameramen, with the permission of the fishermen and the commissaries, may remain on the outer perimeter of the chosen box; however photographers and cameramen may not pass the line drawn by the organisers which will be 2 metres behind the line of fishermen. -23- Anglers must wait for the first signal before entering their angling position; after this signal, the competitors may start preparing their equipment, measuring the depth only with the use of a lead (feeder is not allowed), trying their lines, preparing their ground baits and putting their keep-nets into the water. They have 90 minutes at their disposal to perform these preparatory phases; anglers are not allowed to get out their ring during the preparation. After a second signal, anglers will have 5 minutes left before the start of baits and groundbaits’ controls. The check of baits and groundbaits shall always start from the N° 1 of each sector, 45 min before the start of the competition. After the third signal, anglers will have 10 minutes for groundbaiting. Groundbaiting is only allowed by feeder. It is formally forbidden to use hands, catapult or any other engine for the ground baiting operations. The fourth signal will mark the beginning of the leg. The fifth signal warns competitors that there are only 5 minutes left before the end of the competition. The sixth signal marks the end of the competition; after this signal, no fish will count unless it is caught and totally clear of the water. The acoustic signals for the different phases of the championships should be short; in all cases, it shall be the beginning of the signal to be taken into consideration. -24- During the competition, individual stewards assigned to single competitors shall stand behind the angler, on his right or left side, in such a way that they do not disturb the angler, but can still control the fish caught by the angler assigned to them. Keep-nets must be placed so that the stewards can see them; the fish shall be deposited and kept alive in the keep-net until the weighing team arrives. -25- The weighing operations shall be performed by 5 teams composed of 5 members each. One person is responsible for the weighing. The other three people are in charge of all other operations. Each sector will have a scale at its disposal. The recipients used for weighing the fish must be perforated to allow the water drainage. When very small fish such as alevin or fry are caught, which do not register on the scales (scales scores 0 grams), the fishermen will be classified in order of how many fish were caught and then placed in order after those fishermen who qualified according to the weight of the fish. -26- Until the arrival of the weighing team, the competitors must leave their keep-nets containing the fish in the water. The fish shall be manipulated with caution by a member of the weighing team; they shall be weighed, not counted; after the weighing, the fish must be put back into the keep-net of the person who has caught them, the keep-net must be put into the water without delay. Only at the end of the weighing of the fish of all members of the sector, the person responsible for the weighing will give the order to put back the fish into the water. This system allows those responsible to verify the weight in case of complaints. The fish must be put back into the water with the utmost care (except for other local rules on the matter). -27- The competitor must be present during the above described operations to control the weight and sign the weighing protocol which indicates the weight of the fish caught. After the end of the weighing operations in the sector, when the fish has been put back into the water and the weighing protocol has been signed, no complaint about the weight will be accepted. -28- An international JURY will be appointed to examine any complaints lodged and to apply sanctions as per the rules; the JURY will be made official during the first team managers’ meeting. The President of F.I.P.S.e.d. or the substitute nominated by him. The General Secretary of F.I.P.S.e.d.. The members of the Executive Committee of F.I.P.S.e.d. and of the technical, young and environmental commissions that are present at the championships. The delegate representing the organizing nation, unless he is of the same nationality as the above mentioned members, apart from the President of F.I.P.S.e.d. (or his substitute) who will automatically be the President of the Jury. -29- Any complaints, except for those regarding the classifications, must be submitted to the JURY within 1 hour after the end of the leg. The complaints may be presented verbally, but they must immediately be confirmed in writing. Complaints concerning the classification must be made within 30 minutes after the official results have been published. The time of publishing will be noted on the official result list. A deposit of € 100 must accompany every written complaint submitted to the JURY. If the JURY does not uphold the complaint, the deposit will be forfeited into the account of F.I.P.S.e.d..
-30- The rules, which are published in the 2 official languages, shall be made available for the JURY and the team managers by the organization of the Championship. a) Warning (yellow card) for the infringement of articles 11, 12c, 13, 16, 19, 20, 22, 23, 24 and 26.
b) Disqualification (red card) for the infringement of articles 12a, 14, 17, 18, 35, 38, 39.2 and 40 after a second warning for the infringement of articles 11, 12c, 13, 16, 19, 20, 22, 23, 24 and 26.
c) Disqualification of the nation for the infringement of articles 37a, 37b-1 and 37b-3. d) If an angler is disqualified, a number of points equal to the number of participating nations + 1 will be assigned to him. If an angler is disqualified, the anglers which follow him in the classification will keep their original placing (for example: X that was qualified 8th is disqualified, the subsequent anglers will keep their places and will mark 9 points, 10 points, and so on). e) If a nation receives a warning, this will be noted in its file and remain archived for a period of 3 YEARS. In the case of a new infringement during this 3-YEARS period, this will be considered as a relapse and the JURY will make its decision, taking this relapse and the list of sanctions into consideration. reserves if they commit infractions or behave in a bad way, also if these infractions are not specified in the official regulations. -32- The members of the Executive Committee of F.I.P.S.e.d. may access the competition venue and make notes of any infringement of the rules. Up to 25 nations: the classification for each sector will be calculated as usual; starting from 26 nations: sectors shall be divided into two under-sectors; in case the number of nations is an odd number (example: 27 nations; in the 1st leg, the competitor positioned in n° 14 will be considered in both calculations of the 2 under-sectors; the placement obtained in the smallest under-sector (from 1 to 14) will be considered for the individual classification; on the contrary the placement obtained in the other under-sector (from 14 to 27) will be considered in the competitors’ classification of that under-sector; in case the competitor ranks 3rd in the under-sector from 14 to 27, the other competitors will be ranked 1st, 2nd, 3rd, 4th, 5th, 6th, 7th, 8th, 9th, 10th, 11th, 12th, 13th and 14th. a) Sum of the team member score obtained by the competitors belonging to the same team in each under-sector or sector. In the case of a tied weight in a under-sector or sector, the competitors in question will totalise a number of penalties equalling the average placing they should have had (example No. 1: two competitors tying for the 5th place totalise (5+6):2 = 5.5 penalties each; example No. 2: three competitors tying in the 8th placing, totalise (8+9+10):3 = 9 penalties each). b) The team with the lowest number of penalties will be classified first and so on. c) Anglers who have not caught any fish will receive a number of points equal to the average value of non-attributed places in their under-sector or sector (example 1: twenty-four anglers, twelve of whom are classified at the first 12 places with a penalty from 1 to 12, the following anglers will mark (13+24):2 = 18.5 penalties each; example No. 2: twenty-nine anglers, five of whom have caught fish and mark points 1 - 5 and the twenty-four anglers who have not caught any fish mark (6+29):2 = 17.5 penalties; example No. 3: twenty-nine anglers, twenty-six of whom have caught fish, whereas the three competitors who have not caught any fish will mark (27+29):2 = 28 penalties). If there is only 1 angler, who has not caught any fish or a missing angler in a sector, he will mark a number of penalties equalling the last position in the under-sector or sector (example: twenty-nine competitors, twenty-eight of whom have caught fish, whereas one has not, the latter will mark 29 penalties). The classification is performed in the same way as during the first leg. a) Sum of the penalties obtained over the two legs; the team totalling the lowest number of penalties will be classified first and so on. b) If a tie on points occurs, the teams concerned will be placed by the highest total aggregate team weight obtained by the competitors over the two legs. c) If a tie still exists on weight, the highest individual weight shall be taken into account and so on. a) Sum of the penalties obtained during the two legs; the angler totalling the lowest number of penalties over two legs will be declared individual World Champion. b) If a tie on points occurs between two or more competitors, then the angler with the highest aggregate weight over two legs will be declared the winner. c) If a tie on weight occurs, the angler who has the highest single weight in one of the legs will be declared the winner. d) Finally, in the event that a tie still occurs, one will perform an addition of the sum of the drawing lot numbers of the two legs. The highest total will prevail. e) The anglers participating in one leg only, will be classified at the end of the individual classification and in order of placing. A world ranking list per nations, considering the last 5 years (as F.I.F.A.’s rankings), will be realized for all championships; this ranking list shall be updated every year and published on the F.I.P.S.e.d. website. -34- The classification will be carried out by the organization in the presence of the President of F.I.P.S.e.d. or his representative and possibly also together with components of the JURY. 4.50 (15 feet) meters maximum. -36- IT IS AN OBLIGATION for Organizers to take out a “CIVIL LIABILITY” insurance to cover the organization of all legs; a certificate issued by the insurance company, in which it is certified that all legs are covered by a “CIVIL LIABILITY” contract, must be handed over to the President of F.I.P.S.e.d. two months prior to the competition. a) The official training must take place in the official venue. 5 days of training (Monday, Tuesday, Wednesday, Thursday morning and Friday morning). Training on Friday morning will be compulsory for all nations (complete teams composed of all their anglers). 2 days of competition (Saturday and Sunday). c) To enable all nations to train on the official venue, the organisers will attribute a part of the venue called a “BOX” by a drawing lots carried out within the venue between 7 and 8 a.m. on the first day of training (it is necessary to include the hours and the place for this operation of drawing lots in the program). Each “BOX” will consist of 6 consecutive fishing angling areas. The drawing of lots for the “BOX” shall be monitored (system for drawing lots established by F.I.P.S.e.d. and rendered available for the organizing nation). During training, anglers are allowed to use the same amounting of baits and ground baits as the maximum amounting allowed during the competition. It will be allowed to fish without any interruption until 06:00 pm, excepting until 02:00 pm on Thursday and on Friday. No training will be authorized after 02:00 pm during these two days. Venues must compulsory get free as from 3:00 p.m. on. No fishing is allowed before 10:00 am and after 06:00 pm. The teams must respect these hours (no baiting will be authorised before the official signal). -38- It is strictly forbidden to place competitors within a minimum distance of 25 meters on both sides of any electrical plant (electrical lines, transformers, trellises, etc.). No angler is allowed to access his ring or prepare his material; a signal indicates the postponement of the access into the angling ring or the end of the preparation phase. If the weather conditions so allow, and within the limits of the schedule, the leg may be regularly performed. If the weather conditions do not improve or if the schedule of the program does not allow so, the leg will quite simply be annulled. The cancelled leg will not be considered. The ranking list will be drawn up according to the disputed leg. The cancelled one will not be rescued. The leg is immediately interrupted (a 1st signal will be emitted by the organizers) and all competitors must take cover. If the weather conditions so allow, the leg will continue and a 2nd signal will inform the competitors that they may return to their rings; a 3th signal, 5 minutes later, will authorize the competitors to resume the angling. The duration of the leg may be reduced if the schedule of the program does not allow the continuation until the end of the 5 planned hours of angling (based on a decision taken by the Jury). -40- F.I.P.S.e.d. adheres the world anti-doping code applied by C.I.P.S..
-41- Advertisements are not obligatory. -42- A contribution of 150 € must be made by each participating nation and this fee will remain at the disposal of F.I.P.S.e.d., whereas the sum of 400 € paid to the organizing nation, will remain at the disposal of C.I.P.S. (to be paid to the C.I.P.S. treasurer). -43- The opening ceremony and the presentation of the teams must take place two days before the first leg at 6:00 pm. The duration of this ceremony shall not be longer than 2 hours and shall not end later than 8:00 pm. The first 3 teams and first 3 individual competitors will officially receive GOLD, SILVER and BRONZE medals. In conformity with the International standards, the awarding of the prizes will be accompanied by the corresponding National Anthems and the raising of the winning nations’ National flag. The medals will be offered by F.I.P.S.e.d. and they will be handed over by its official representative. All other forms of acknowledgement will be distributed equally among the participating nations. All participating nations must bring with them their flag and their national anthem. During the course of the ceremony announcing the official results, the winning Nation may be represented on the podium for the handing out of medals and playing of the National Anthem by up to 9 persons. -44- In case of controversies about the interpretation of these rules, only the French text will be considered as the original text and as reference text. b- send out official programs and information about the championship in the 2 official languages (English and French). Правила проведения соревнований по спортивной ловле рыбы на донную удочку методом квивертип. МФРС 2012 г.